Depressed? Treatment May Be A Phone Call Away : Shots - Health News Therapists can treat depression just as effectively over the phone as in person, research shows. And patients are more likely to stick with treatment because phone calls fit into busy lives more easily than regular visits to a clinician's office. 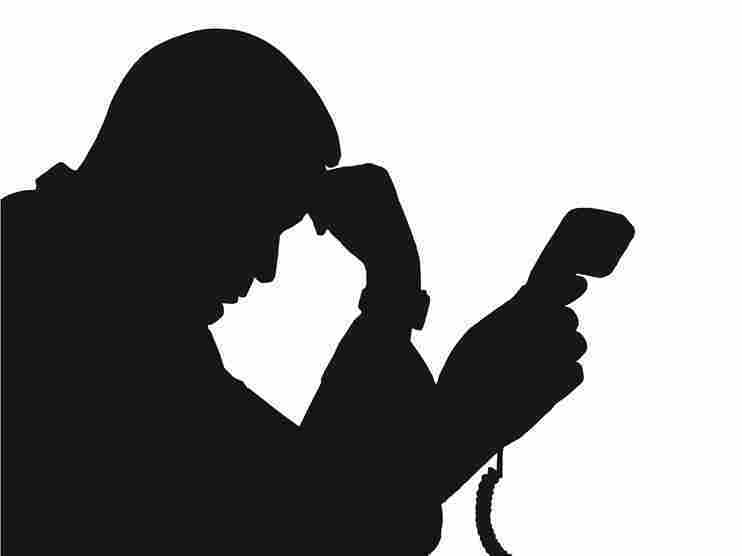 Depression can be treated effectively over the phone, and a test of the approach showed that patients are more likely to maintain treatment telephonically. Researchers at Northwestern University Feinberg School of Medicine offered 18 weeks of cognitive behavioral therapy, a kind of talk therapy, to more than 300 patients with major depression. Half received treatment in person and half over the phone. In CBT, therapists help patients identify unhealthy patterns of thought and action and then change them. It's proved effective for a number of disorders, including depression — at least, when delivered face-to-face. Most people with depression say they prefer therapy over antidepressants, but in practice they often miss sessions with a therapist or drop out of therapy altogether. Lead researcher David Mohr tells Shots that many people struggle with the logistics of a weekly visit. "Often they need to travel some distance to get there," he says. "They may need to take time off of work, or away from their family." The promise of treating people over the phone is that it might overcome the demands of patients' busy lives. Only 4 percent of patients receiving phone therapy dropped out during the first five weeks of treatments, versus 13 percent in the face-to-face group. After that, the dropout rate was about the same in both groups. At the end of the treatment cycle, both groups of patients showed similar levels of improvement in their symptoms. Six months later, the patients who received treatment in person showed a bit more lasting improvement. But Mohr says the discrepancy is small, and doesn't necessarily mean that face-to-face therapy is having some lingering effect that isn't noticeable at first. "We were able to keep people in treatment using the telephone who would have otherwise dropped out," he says, and that group included people with more severe symptoms, or other factors that might require continuing treatment. In the face-to-face group, many of those people never made it to week five, much less to the six-month follow-up session. The results were just published in JAMA, the Journal of the American Medical Association. The American Telemedicine Association has published guidelines for so-called "telemental health," which includes over-the-phone treatments. But Mohr says insurance companies have been wary, and for the most part do not yet cover or reimburse phone therapy. Technically, telemedicine is finally ready for prime time, as NPR reported last year in a story about long-distance care for patients with Parkinson's disease. High-speed Internet connections and devices with built-in cameras are easy to come by. But regulations and rules for payment remain a challenge.